Chocolate for charity… ’nuff said! We’ve teamed up with The Sick Children’s Trust and hosted a huge chocolate cake bake off (try saying that after a few gins) here at WO HQ! 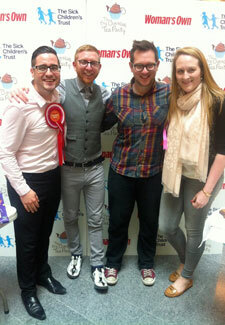 With over 65 cakes entered into the competition our favourite judges Paul. a. 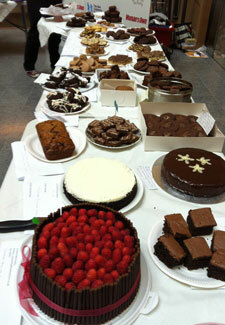 Young and Edd Kimber had a lot of nibbling… er, we mean judging to do! There was everything from pigs in mud cake (two! ), chocolate and ginger bake to chocolate and chilli cookies. The aroma filled the room – it was a good day. AND through the sale of cakes we raised a whopping £610 for The Sick Children’s Trust, not to mention the £1-a-go tombola, with chocolatey goodies from Cadbury’s, M&S, Asda, Aldi, Thornton’s, Hotel Chocolat and Krispy Kreme. On the left, Robert Shore wowed the judges with this moist Ginger and chocolate bakes, taking home the rosette and title of best baker, not to mention a Kitchen Aid Food Mixer! Edd told us, ‘they were delicious just like granny used to make.’ The second winner was Grace Cullen, with her tasty chocolate flapjacks, ‘very moreish’ said Paul.a. Young.